It’s said that people stand together in moments of great revelation in a realm beyond space and time. It seems that those who accompanied us in life remain with us in a similar place. For you, Julius Lester, your family and all whose eyes and ears you opened and hearts you stirred, brightness and love on the journey! Inner growth is hidden in the coldness of winter. Beneath the surface life stirs, preparing to emerge when conditions are right. Within each of us is a hidden tree, growing, unseen, in answer to a call we may not recognize. Listen. In the stillness there is life. One Light, before time beyond time, and just in time. A paper sculpture to welcome the emergence of the year. Paper Sculpture in wooden box: 20"x 20"x 1.5"
Walking by the river, last winds of autumn, these words came to me; "we do the dance. you bring the rain." Creating the image was an extension of the gift of this insight. An entire life lived trying to bring the magic of healing to the wounded world, the family, those I am closest to. Broken open by the sudden knowledge that it was always out of my hands. I cannot bring the healing, I can only do my dance, my art, walk the sacred path. I can surrender, lay down this futility. It is only in partnership with others and with the life giving force of the Hidden that anything manifests in this world. The rhythm of my heartbeat, the fall of a star, the turn of a leaf all governed beyond my will. I do the dance, with all my love and strength. The rest is in the realm of the mystery. 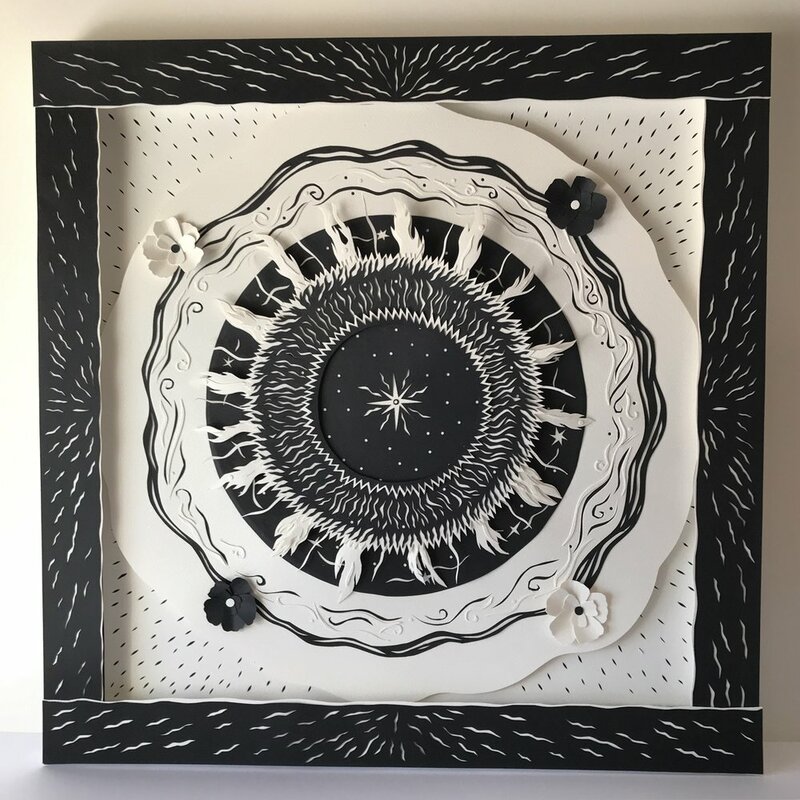 Paper Sculpture in a wooden box: 20" x 20" x 1.5 "
For me, this is a sacred story. With our hearts closed all we can do is place the words on our hearts and know that one day our heart will break open and we will remember. If it is true for myself it is true for others. It is not a defeat to recognize that there are doors that only unlock from the inside. And what did they do in the folktales? They built their fires, and sang their songs and danced the darkness down till the demons melted into the light and the great secrets burst like pomegranates and fed sweet juice to their lips and they swam the river home to freedom. Vertigo. Yes, I've lost my balance in this dizzying world. Paper Sculpture created from music paper form Symphonie Fantastique composed by Hector Berlioz, 1830. Wooden Box 8"x 8". Baker's twine. 3 Bells. Deep Time. The still moment that slices through time and space as outward and inward become one. Here we recognize our temporary dwelling as a gift exchange from one friend to another. Paper Sculpture in 10" x 10" wooden box. At this late hour, I am still learning the ropes, here in the remarkable circus of life. The audacity of creation, to finally hang stars in the sky. 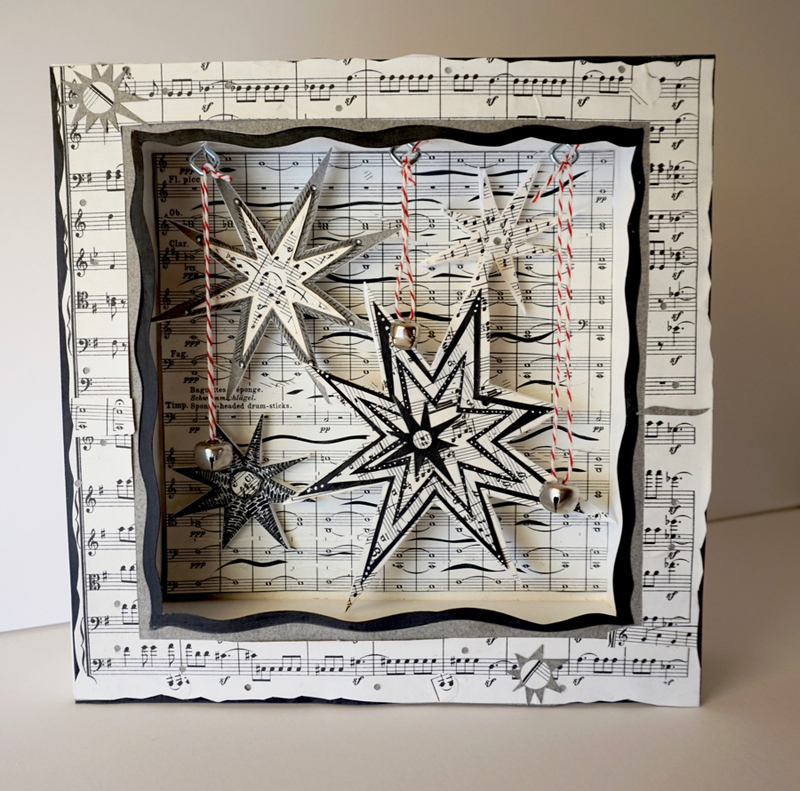 Paper Sculpture in 8" x 8" wooden box, with stars on wire attached to screw eyes. Raven Paper Sculpture in 10"x 10" Box. Ravens fill the sky, endless streams of them. They gather in the snow, leaving footprints. Very vocal, their haunting voices accompany me as I awaken. They are scavengers, ready to find what I lose. Often I see one walking alone, soon others gather. It seems they they navigate both solitude and belonging. I am aware that they have been here long before my arrival and will remain long after I depart. I feel known in their presence. Ride the Wave paper sculpture in 12"x12" box. Keep riding the waves, traveling between air and water, rise to the shallows, return to the deep. I am having trouble finding resonance in the world at the moment. Long ago, in the early hours of the velvet deep, I witnessed a blue star falling close by with a golden orange tail, into the deep and silent woods. I have held the sound and color close and lately it has been a sustaining presence in my inner life. At times it is beauty that ties us to this world, remembered shifted light, indwelling. Another addition to the broken and holy hallelujahs series, a 10" by 10" white box. Enjoying the confines of the square boxes, feels like a river almost flooding it's banks. Sometimes a container allows for expression, because it holds the boundaries close, as we wander the margins. And Yes! we keep saying yes, even on the darker, wintry days of the human spirit. In this newly broken year, may we find light and healing. This is an outcry and an exultation for the broken and holy. This is a hallelujah for the life not confined to the shallow spaces we may find ourselves in. This is for knowing that the conversation continues even when we find ourselves feeling so alone, somewhere the conversation goes on. Even when we are missing, grieving, outside of, we are also a part of the great and ancient Mystery of Life and the legacy of our ancestors. We continue on the path they started and we turn it upside down as they always knew we would. This is why they handed it down to us and we hand it on to others. We go deeper and we fly in the depths. This is how we rise. The sense of returning to a Home still deeper than in our bones. Rivers of stars and rivers of water have always reminded me of home. Thank you to Legion Paper, for the beautiful Colorplan paper that inspired this paper sculpture! It was a delight to put my work up in the Thomas Memorial Library in Cape Elizabeth. There are over 30 paper sculptures. Some are on the wall and some are in the cases. Most of the work was created over the past year. The trustees at the library have been very supportive and helpful with hanging work in the gallery. It is a beautiful space, and the cases have a most wonderful wooden smell inside. The show will be up through September, so if you are in this part of Maine, stop in! Nearby, Kettle Cove is becoming quiet with the shift in season to September.